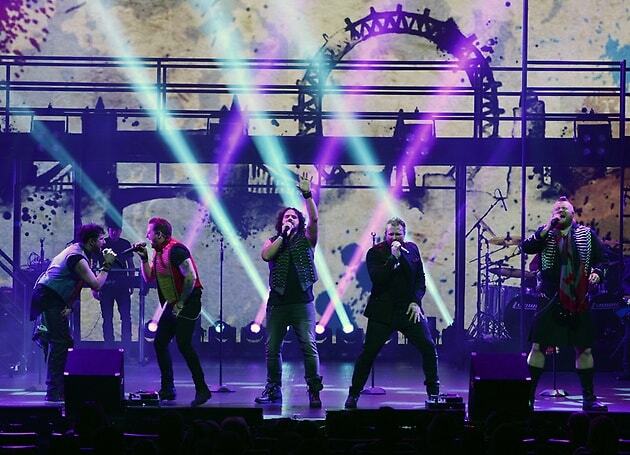 Tenors of Rock is the perfect Las Vegas concert for you to watch if you love rock! Are you ready to rock the night away? The high energy show is ideal for all music buffs of music that ranges from Led Zeppelin to Guns-n-Roses to AC/DC. The concert makes your rock-n-roll fantasies come true when the curtain rises and the five men tear into a version of the Boys Are Back In Town by Thin Lizzy. The five men work effortless during this cover before switching gears and play Back in Black a cut from AC/DC. From here the energy in the audience is tremendous with the crowd singing along to anthems such as Living On a Prayer by Bon Jovi, Sweet Child O’ Mine and the guitars roar on a perfect rendition of Whole Lotta Love. As the evening progresses the songs just keep coming down the pipe as the stage explodes with fireworks, fire cannons and plenty of multimedia effects from lighting to videos to disco balls going out of control. The music is delivered in a flawless manner with each man taking his position as the lead singer of songs that fit their voices superbly. During the show you can expect to hear other great hits from the past from the Beatles, Rolling Stones, The Who and the crowd is completely in tune when the group begins a rambunctious version of Queen’s Bohemian Rhapsody. Overall, the show brings a scintillating performance to the stage that any rock-n-roll fan would be happy to hear. 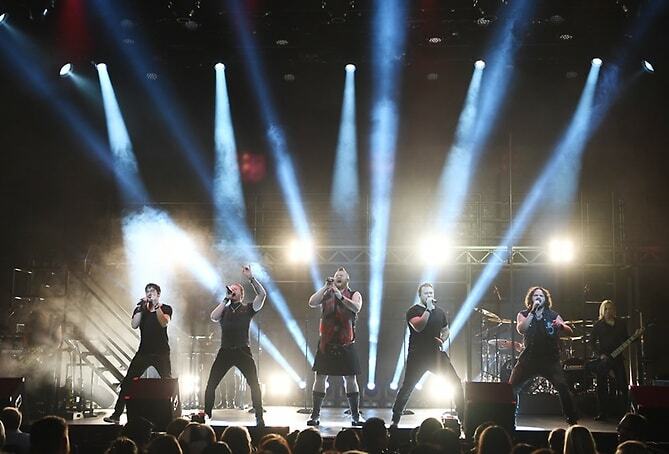 So, if you are in to the heavy sounds of guitar in harmony with five of the best voices in the world, then the Tenors of Rock is a must see Las Vegas show for you. 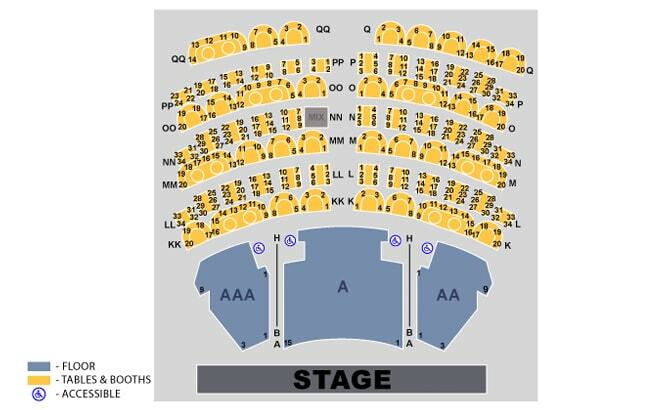 Use the seating chart above to find the best seats for The Tenors of Rock show in Vegas. The show plays in the 500 seat Main Showroom at Harrah’s Las Vegas. Seating is composed of an orchestra section as well as a second level of seating that includes tables and booths. The best seats for this show are within section A and guests find the table and booths are ideal for groups of four or more. All seats within the showroom have good sight lines to watch the musicians as well as the multimedia effects and the acoustics in the auditorium are good throughout. 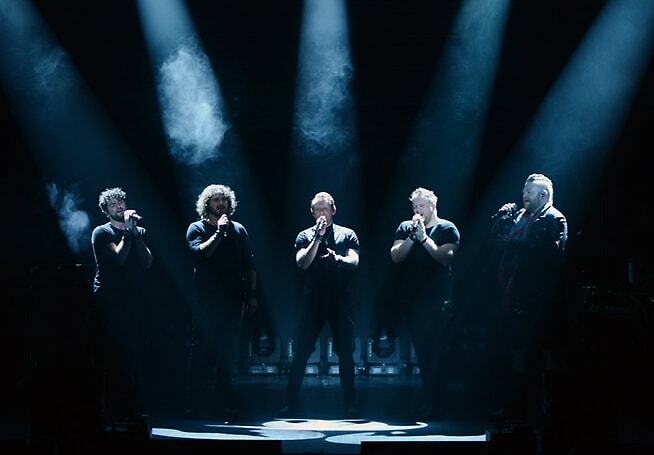 The Tenors of Rock cast is composed of five gentlemen from the United Kingdom who are Gareth Richards, Dai Richards, Jimmy Denning, Jonathan Williams and Tommy Sherlock. The members have been honing their singing skills for more than two decades working as roadies, actors, body guards, dancers and front men for several previous bands. The guys out with a stunning performance on the X-Factor in the U.K. Since this breakout the band has played around the world including shows in Moscow, London, Shanghai, New York and Las Vegas. The cast of the show is accompanied on stage by a full live band. The Tenors of Rock is performing at the Main Showroom within Harrah’s Las Vegas. The 90-minute show runs Wednesday through Monday beginning at 8:00 P.M. Ticket holders must be 5 years of age or older to attend. Reserved seating, tables and booths are available.